This is painting Seven in the 30 Paintings in 30 Days challenge. I have always wanted to paint a Lupine flower stalk from my garden. The lizard was from a trip that I took to visit my sister in Atlanta and we went to the Botanic gardens. The lizard was sunning himself. The colors of the flower and lizard go great together. I used a soft focus background so that the flower and lizard would stand out. I did this by wetting the background with water and then put all the color in while it was still wet. I masked my flower and lizard with masking tape prior to painting the background to keep them white. 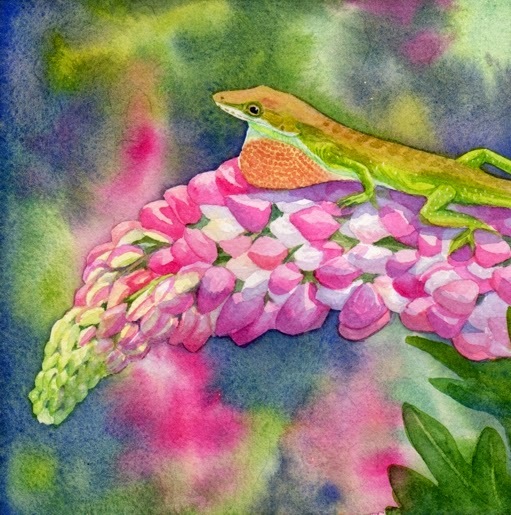 "Lizard and Lupine" is a 6"x6" watercolor and it is available for purchase on Daily Paintworks for $90 - Click here to purchase.